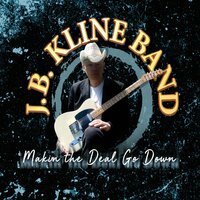 The long awaited 4th CD album from J.B. Kline.... "Makin' The Deal Go Down" is here !! J.B. worked hard and long to try and produce sounds to equal his heralded early efforts, and we think he has done it !! And like his 3 previous CDs, this one contains songs with an assortment of feels and styles...... with R&B, Blues, NJ Rock, and Country being his most obvious influences. The title cut, is a solid, show stopping dance cut, with lyric references to his early days growing up in Lambertville NJ. In fact, another one "A Summer Night (In Old Lambertville)" is dedicated to his home town.... "Dress Of Faded Red" is about women of the night he knew while living in NYC. And "I Have His Guitar" is for an old lost friend and a new one !!! J.B. Kline has been compared to Ray Charles on a couple of the tracks, the Eagles on another !! ...There are 2 gutsy old blues numbers, and some Philly-style soul !! But all in all, its 100% J.B. Kline !!! The long awaited 4th CD album from J.B. Kline.... "Makin' The Deal Go Down" is here !! J.B. worked hard and long to try and produce sounds to equal his heralded early efforts, and we think he has done it !! And like his 3 previous CDs, this one contains songs with an assortment of feels and styles...... with R&B, Blues, NJ Rock, and Country being his most obvious influences. The title cut, is a solid, show stopping dance cut, with lyric references to his early days growing up in Lambertville NJ. In fact, another one "A Summer Night (In Old Lambertville)" is dedicated to his home town.... "Dress Of Faded Red" is about women of the night he knew while living in NYC. And "I Have His Guitar" is for an old lost friend and a new one !!! J.B. Kline has been compared to Ray Charles on a couple of the tracks, the Eagles on another !! ...There are 2 gutsy old blues numbers, and some Philly-style soul !! But all in all, its 100% J.B. Kline !! !